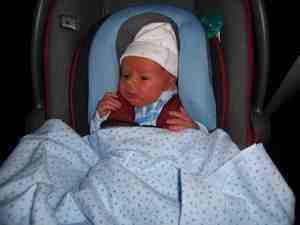 My son is 19 lbs and over 28 inches - when should we consider getting a new carseat? What is the next step in seats? Every car seat is different. Look on the side of your infant’s car seat and you can find the weights and heights allowed. Once your child is close to out growing their infant car seat most parents will need to purchase a convertible car seat. Convertible car seats can be installed either rear or front facing. Choose a car seat that fit your child’s current size and allows for growth. Car seat requirements are different in every state. - Children must be in rear facing car seats until they are 12 months and 20 pounds. Honestly, in regards to child car seat safety Florida has some of the least protective laws in the United States. Montana and Alaska have stricter laws! One of the hot topics in car seat safety is extending the rear facing period beyond 12 months. In the spring of 2009 the AAP News sited an article that could change the AAP policy on car seats. This study “Car safety seats for children: rear facing for best protection” is author by Dr. B. Henary et al. This study looked United States crash data between 1988 and 2003. While it concludes that rear facing car seats are safer for children under 2 years old, the study has some limitations. - only statistically significant finding is in side impact crashes (the least common type of crash). While I do not think this study is strong enough to change AAP policy, I do believe that the issue needs to further studied. - Rear facing until 15 months old and 20 lbs.